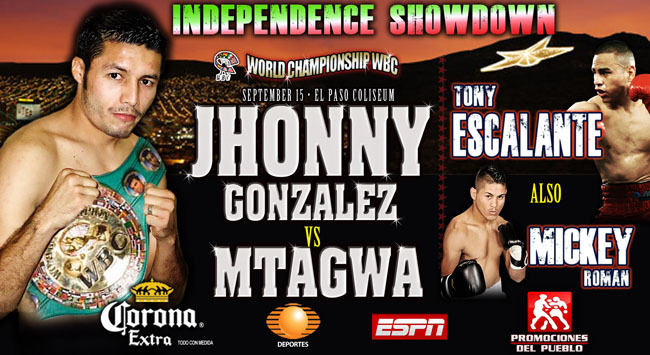 Jhonny Gonzalez successfully defended his WBC featherweight title against Rogers Mtagwa, celebrating his 30th birthday as well as Mexican Independence Day. Gonzalez scored an impressive second round technical knockout. He stopped the veteran brawler in the second round showing his great offensive skill. The champion put some nice offense late in the first round, and totally dominated in the second. Gonzalez opened up in round two and rocked Mtagwa with a series of big shots, chasing his opponent around the ring, landing hard shots to the body and head. Mtagwa was definitely hurt and the bout was waved off by referee Jose Guadalupe Garcia at 2:15 of the 2nd. Gonzalez, former WBO bantamweight titleholder, defended his crown for the 2nd time and bettered his record to 48-7-0 (42 KOs), while Mtagwa, 32 from Tanzania, reported 27-15-2-1 NC (19 KOs). After the fight, Gonzalez said “Thanks El Paso, Viva Mexico!” and again called out the best of his division. “I want the best, Elio Rojas, Yuriorkis Gamboa, Juan Manuel Lopez and the others at this weight. Other world champions are: Chris John (WBA) and Orlando Salido (WBO). On the undercard, El Paso's own Antonio Escalante, 25-4-0 (16 KOs,) beat down Pipino Cuevas Jr, 14-8-0 (12 KOs), son of former world welterweight champion Pipino Cuevas, in the first round..
Super-Featherweight Escalante, was knocked down early in the fight, but it was ruled a slip, then quickly crushed Cuevas Jr, stopping his opponent at 2:08 of the 1st round. Escalante's old rival super-featherweight “Mickey” Miguel Roman, 36-8-0 (28 KOs), also had a short night, knocking out veteran Antonio Meza, 25-11-1 (17 KOs), in round one with a perfectly placed left hook to the liver. Meza was counted out on his knees at 2:09.